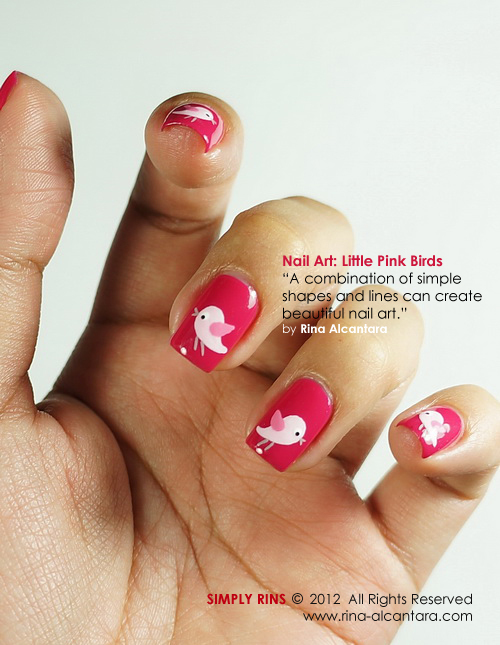 This is a simple freehand nail art. I say simple because the design was created using simple shapes and lines. Not much detail was added but I still loved how it turned out regardless. It was one of those nail art sessions wherein I decided on my base color first before I thought of a design. This is Color Club Overboard in 2 coatings. It's a dark pink polish that has a very shiny finish. Application is easy and opaque with 2 thin coats. 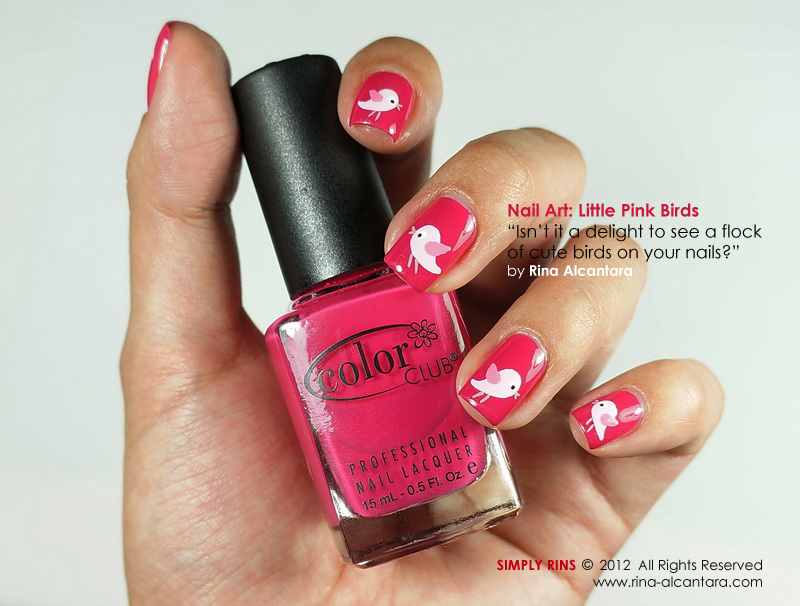 I hand painted the little birds with acrylic paints, detailing nail art brush, and dotting tools. I didn't want to overpower the color of the polish so I figured if I did a monochromatic sort of design, it could even enhance the playfulness of the color. So I brought out my darkest pink acrylic paint and white tube and started mixing 2 different shades of pink. I used a lighter pink hue for the body and a darker one for the wings. I just had to make sure the darker shade will still pop from the base color. For the legs and beak, I used a very light brown color so as to make it more visible on a relatively dark background. I think it's because it's summer here that I am into the bright color phase on my designs lately. 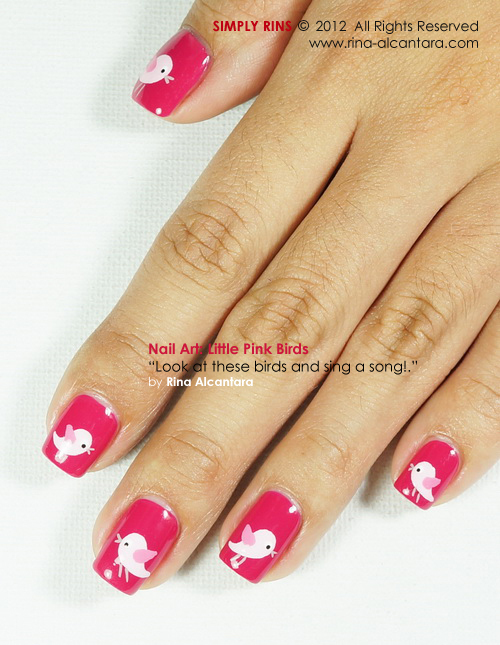 They are cheerful to look at and makes any nail art more interesting. 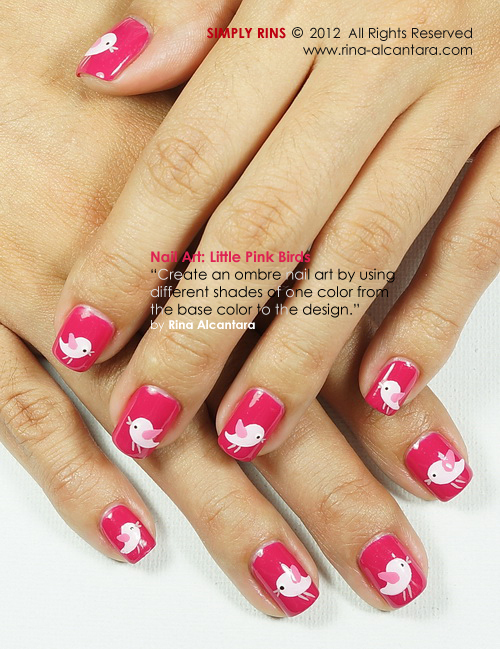 This probably means that you'd be seeing more colorful or cheery nail designs for awhile here at Simply Rins. I wonder if I should name all 10 little pink birds. What do you think? Disclosure: Color Club Overboard was sent as a gift from Beauty Lane Philippines. They carry a wide array of beauty products, including China Glaze and Color Club nail lacquers. Find them on Facebook -- beautylanephilippines -- for more details. Ahhh these little birds are so cute and I love that you kept it monochromatic. You just revealed one of my secrets! Haha! I am not fond of the rain. It almost always gives me a bad cold. Oh my these are cute! Might try to copy them! You're so creative Rins! These are so great! Another design going in my folder to try later! I will. I actually excited about it. :) Thank you for following it up. How do you do it? It's clear that you have an innate talent for this, but seriously, how do you get to be so good and precise? I could only dream of painting my nails with the cute and colorful designs that you display here, I've only just recently learned how to paint my nails a solid, uniform color with both hands! Love it! You always have that distinct style and knack that hints at your cartoonist background!